Cook County General… Chicago, Illinois… Room 317… 11:30p.m. Everything hurt. Cheryl looked at her friend and that’s what she saw. And that is what she would probably say when she awoke. It had all started with that damn PennySaver ad. “Why waste money on a repairman when You can fix it?” “Let us show you the easy way to Do-It-Yourself!” She had told Ethel there was no easy way, and that a few online classes wouldn’t make her an expert on fixing things. But Ethel had replaced the cord on her window shade and fixed her blender, though she was out of her protein shake phase, so she had to give her credit for that. Earlier that day, Cheryl had just fixed lunch and was going to watch the Big Brother episode she had recorded when the phone rang. Cheryl was wishing there was another bed in the room when Ethel moaned, stirred and her eyes popped open. 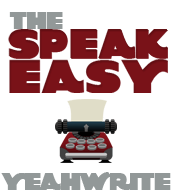 The Speakeasy is back from summer vacation! Submissions must be 750 words or fewer. Submissions must be fiction or poetry. You must also include a reference to the media prompt. TedBook is dedicated to the musings and pseudo-literary efforts of Ted Strutz and his ‘friends’ who care to comment. The Book is kept in Friday Harbor on San Juan Island in the Great Pacific Northwest and is open 24/7 for any who care to turn a page.